At Hannover Messe 2019, Fraunhofer FIT will present data-driven modeling supporting production planning and optimizing resource utilization. The models help to understand and optimize complex processes, and can be used as predictive tools. In addition, we demo a system that uses AI-based image processing to monitor and evaluate, in real time, the situation and behavior of people, e.g. in a production setting. The system may be used, for instance, to automatically raise the alarm if a person is sitting or lying on the floor, indicating a dangerous situation. Meet us in hall 2, booth C22. Automation and the development of business processes require data that inform the optimization of processes or the development of innovations. At Hannover Messe 2019, Fraunhofer FIT will present a platform technology that integrates smart databases, specific analysis methods as well as networked sensors and measuring instruments. Functionalities such as maintenance and operations are represented in the data models and may be enhanced to include predictive maintenance. This facilitates agile development of new services and business models and their flexible adaptation to rapidly changing customer needs. "It is important to understand that – in contrast to traditional production and automation technologies with their highly customized but inflexible models – with data-driven models we're no longer looking for absolute results. The models take into account that data acquisition and data quality can be adapted to situational requirements, to be able to react more flexibly", explains Prof. Dr. Harald Mathis, leader of the Biomolecular Optical Systems group at the Fraunhofer Institute for Applied Information Technology FIT, who also heads the SYMILA Fraunhofer Application Center at Hamm. Another important component of our system is what we call Smart Data Exchange. It guarantees a maximum of data security and data integrity, e.g. if data must be transferred from one production site to another. Our second exhibit is a smart video system to protect workers in hazardous work environments. The system is capable of detecting the basic anatomical structure of humans, i.e. head, rump, arms and legs, in a live video stream. The method used is called Realtime Pose Estimation. Based on the detected anatomical structures and their orientations, additional neural networks determine the postures of the detected figures, e.g. 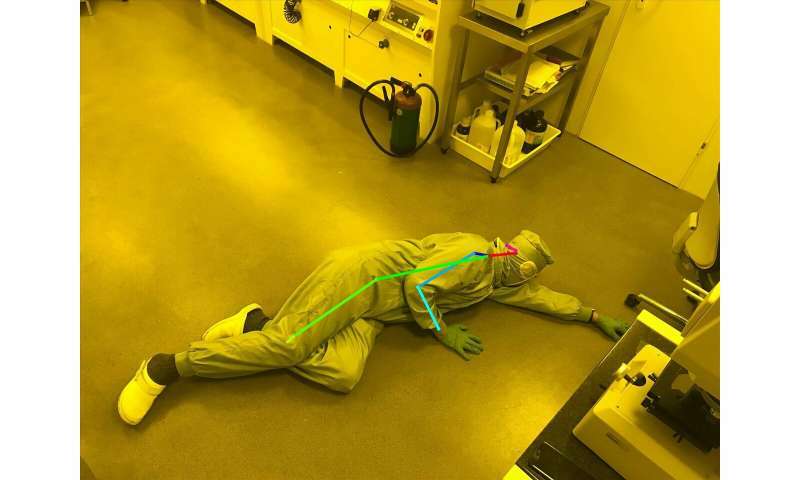 if a person is standing, sitting or lying on the floor in the area under surveillance. Realtime Pose Estimation is an AI application. The algorithms broadly mimic neural processes in the brain, simulating a deep network of nerve cells. Analogous to the human model, these neurons learn from experience and training. We used the COCO dataset, which contains some 250,000 images of persons with their body parts identified and annotated, and several further datasets to train our system. It can now reliably identify body parts in unfamiliar scenes in live video streams.